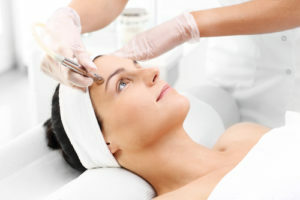 A chemical peel is a technique used to improve the appearance of the skin. A chemical solution is applied to the skin that causes it to exfoliate and eventually peel off. The new, regenerated skin is usually smoother and less wrinkled than the old skin. Our highly trained staff will help you to get best results. Our Signature Facial is customized based on skin type and need. After initial consult our staff will decide and discuss with you what type of facial is right for you. Every client is advised treatment based on findings of the initial consultation. Listed price is base price. This is the best remedy for those who are experiencing either mental or physical stress. Our staff is specially trained in the United Kingdom for performing this treatment. This facial not only relives stress but helps to get deep physical and mental relaxation. As a result, a feeling of well being is developed. It is truly an experience like no other. LED photo-rejuvenation treatment is a non-invasive treatment which is used to activate the skin cells with low non-thermal light energy. It can help to alleviate the subtle effects of aging, make the skin appear more radiant, plump, and smooth, even visibly diminish the appearance of fine lines, wrinkles, and age spots! 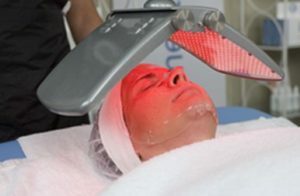 We also utilize LED therapy to tighten large pores, improve skin clarity, and soften redness. We recommend four to six treatments depending on the reason of treatment. Acne is a skin condition that occurs when hair follicles become plugged with oil and dead skin cells. Acne usually appears on face, neck, chest, back and shoulders. Effective treatments are available, but acne can be persistent. The pimples and bumps heal slowly, and when one begins to go away, others seem to crop up. Acne is most common among teenagers, with a reported prevalence of 70 to 87 percent. Increasingly, younger children are getting acne as well. Exfoliation eliminated the dead surface skin cells and oil that plugs sebaceous pores – the leading cause of black heads, white heads, and other Acne flareups – and leaves the skin dull and listless. When exfoliation is done using right techniques it helps to improve complexion, increasing blood circulation, prevent breakouts , reducing fine lines and wrinkles. Exfoliate layers of dead and uneven skin when you come in for a facial with one of our skilled Estheticians. 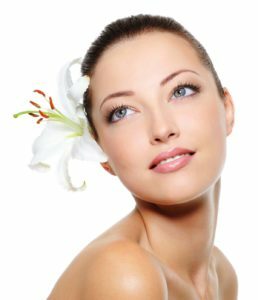 Anti-aging facials use products and techniques designed to slow the aging process, brighten skin, and reduce wrinkles. If you long for a more youthful complexion, select from a variety of anti-aging facial treatments ranging from vitamin-infused serums to light therapy to Oxygen infusion. If you aren’t sure which facial treatment is best for you, but you want younger, revitalized skin, we’ll help guide you on the right path to beautiful skin. This non-invasive procedure Includes micro-current treatment to tone the muscles in your face. It also includes Microdermabrasion to gently take away uneven skin texture. We also use our state of the art oxygen infusion machine to infuse oxygen into your skin to make it plump and younger looking. Lastly we activate your cells using LED Therapy to promote your skin’s natural cell activity. All of this combined with our use of serums and expertise will have you looking and feeling young again. Three phase treatment is designed based on your skin type. This service may require additional treatments such as Microdermabrasion, Oxygen treatment, Micro-current Treatment, LED facial, etc. If you are a professional who is always in front of people, talking to a camera, this treatment is a must for you. This is a highly effective and in demand treatment at our salon. Price listed is starting price. Microdermabrasion treatments use a minimally abrasive instrument to gently sand your skin, removing the thicker, uneven outer layer. This type of skin rejuvenation is used to treat light scarring, discoloration, sun damage, and stretch marks. 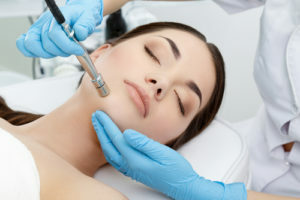 Microdermabrasion can: Improve age spots and black heads. This treatment covers Face, neck and chest area. This treatment targets many skin conditions including acne, mild scarring , hyper-pigmentation , black heads and sun damaged skin. It is an advanced technique that removes the dead skin cells that build up over time and make the skin look dull and lifeless. This treatment targets many skin conditions including acne, mild scarring, hyper-pigmentation, black heads and sun damaged skin. It is an advance technique that removes the dead skin cells that build up over time and make the skin look dull and lifeless.